Yesterday I stated that gold was getting to oversold levels and although I predicted a pop in the asset class in the near term, the technicals were showing that in all probability, the rally would not last. 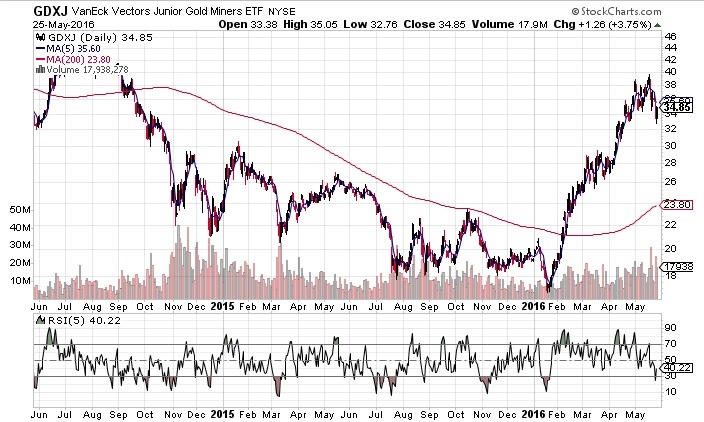 The pop in (NYSE:GDXJ) today spiked the 5 day RSI indicator to 40 (see chart) which means there could be another 3 to 5 days left in this rally. However it won’t hold and traders (if they sold puts or put spreads yesterday) should be prepared to buy back those puts way ahead of expiration because I can’t see this rally lasting all that long. Watch sentiment levels or just take profits when the 5 day RSI reaches anything over 55 as trying to eek out everything you can out of this trade could come back and bite you in the end. 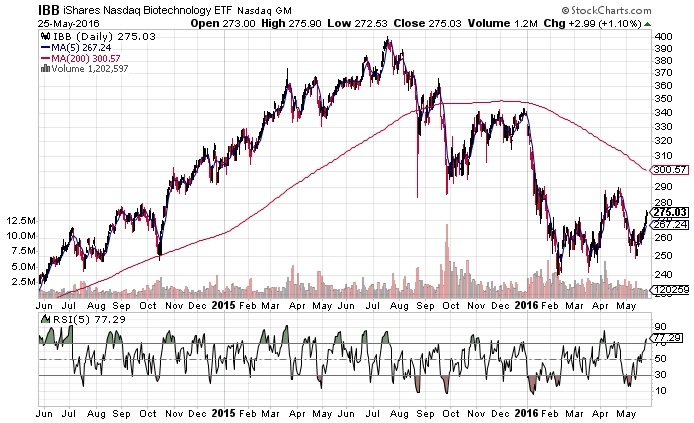 The biotech sector (NASDAQ:IBB) took off again today and it has been easily outperforming the general stock market (NYSE:SPY) since it bottomed a few weeks ago. Although we should get a breather in the short term as the 5 day RSI indicator has reached oversold levels, the draw-down will be short as there should be another 3 to 4 weeks to go in this daily cycle. The recent volume in the leveraged ETF (NYSE:LABU) is indicative of a major pending up move. However holding LABU long term is difficult due to the decay nature of the ETF and also the volatile swings. Furthermore there are so many stocks with excellent fundamentals in this space that could double or treble in the next 12 months. Companies such as Allergan (NYSE:AGN) and Valeant (NYSE:VRX) have significant upside potential. Furthermore both stocks have high implied volatility at present so selling some put spreads seems a good strategy to me. Moreover these stocks provide you with a second chance to get on board the biotech train. The chart below shows how both Valeant & Allergan have under-performed the general biotech index since the sector printed its daily cycle low back on the 12th of May. With the further rally in the S&P500 today, I believe it is only a matter of time now before the market tests all time highs. If your budget is limited and you want to minimize your risk as much as possible, you could buy debit call spreads as many underlyings at present have very low implied volatility levels. Just wrap the call spread around the stock (Buy the in the money call and sell the out of the money call) and go at least 50 to 60 days out to give your trade enough time to work. A market charging higher combined with low volatility is an excellent strategy for conditions we presently have in the stock market. This entry was posted in Trading and tagged (NYSE:GDXJ), agn, VRX. Bookmark the permalink.